I have chosen these vegetables based on this list of the world’s most nutrient-dense foods. They are all readily available, relatively inexpensive and include a variety of different “colour groups” to ensure a broad range of nutrients are represented. Brazil nuts: Even 1 brazil nut a day is very high in selenium which has well documented cancer fighting properties. Why not, right? Ghee: This variety of clarified butter is often used in Indian cooking and is known for being a digestive aid, is safe for high temperature cooking and tastes delicious! Flax Oil: A great way to boost your Omega 3 Fatty Acids, use it uncooked for dressings and sauces. Chia Seeds: Great for digestion, high in vegetarian protein & higher in Omega 3s than flax seeds. Generally I am aiming to eat grains in their minimally processed form. I choose whole rolled oats over quick ones, Ezekiel (sprouted grain) bread over traditional whole wheat & cooked grains (like brown rice or buckwheat). I also include some quicker cooking grains like polenta & whole wheat cous cous for those days when I need something easy. Garbanzos and lentils are included because I prefer their taste and they are very high in soluble fibre. Black beans are great too because they also happen to be high in antioxidants which can help reduce your risk of cancer and other diseases. Because of my activity level I eat a pretty high protein diet. But for health and ethical reasons I limit the amount of animal-based proteins I consume. So in the past this has looked like a lot of eggs, tofu & fish with chicken included maybe once a week and vegan protein powder as a supplement. BUT since this report was updated from Health Canada I have begun to question the type and amount of fish I was consuming and decided to switch things up a bit in the new year. I will still generally avoid pork and red meat (although I have included a little lean beef in this list for diversity’s sake) but will make a concerted effort to broaden my horizons! I am emphasizing hormone free and local meat although I am flexible for purely financial reasons. The fish I have included are all the most sustainable and low toxicity (source) in my region. Not something I have to work hard to incorporate into my diet since I love pretty much every fruit. So the ones I’ve chosen are generally higher fibre/lower sugar with the exception of bananas which are great for prolonged energy, especially before a workout/high impact activity. WATER: OMG I HAVE TO DRINK MORE WATER ITS RIDICULOUS. Green and Herbal Tea: Antioxidants, stress-reducing, metabolism boosting. Probiotic Drinks: Support a healthy immune system. And VOILA! That’s the plan, folks. 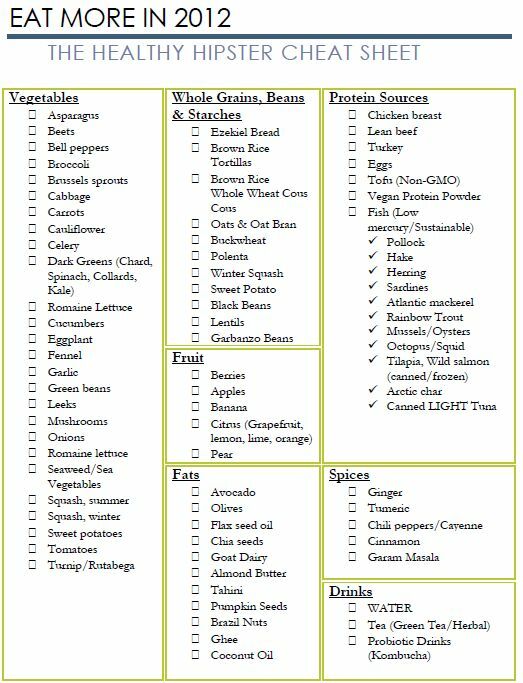 I look forward to following up on this list with some fun and easy recipes, shopping lists and weekly meal plans! Deprivation-free in 2012. A novel concept, huh? this list is awesome! thanks!! This is really interesting, Rose. I feel like I’m still in starving student mode (even though I’m not) — ie. buy whatever is cheapest and then eat the things that you find in the darkest crevices of your cupboard, expired or not. I’m going to use your list for dietary inspiration, because all I want to eat in the winter is grilled cheese. Haha I’m with you on the water thing. And that is one seriously good list man! I actually wrote a similar one out yesterday, for the same reasons! I’m the worst for eating the same things over and over, gotta get more diversittttyyyy in mah belleh.